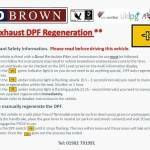 DPF Regeneration – exhausts on Mitsubishi and Isuzu. ND Brown Ltd have produced a brief description to advise their customers on DPF regeneration on Mitsubishi and Isuzu vehilces. Please do not hesitate to contact us if you require any further details and advice. Please note that it is imperative that users perform a regeneration, either automatically or manually, whilts these vehicles are on hire.